Do you know how to escape from a Bear in the woods? Say you find yourself out hiking a Nature Trail on a weekend excursion. There you are, enjoying all that nature has to offer. Identifying plants, birds, small animals and reptiles. Perhaps even searching for Morel Mushrooms or edible Berries. Perhaps, Whitetail Deer hunting. When, suddenly, you come face to face with a Bear. 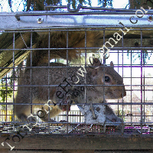 Eastern gray squirrels (Sciurus carolinensis), often thought of as cute, funny, adorable and highly intelligent animals. Unless they have taken up residence in YOUR residence!